Pope Francis: Which Peripheries? What If Pope Francis’ Enemies Are the Same as Pope Benedict’s? 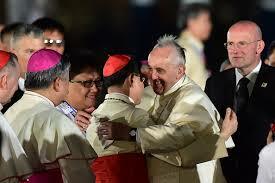 There are five revealing details that emerge from the papal trip to Sri Lanka and Philippines. Five details that perhaps help us to understand better this pontificate, as well the expectations surrounding it. Each of these details can be understood through a single interpretative key, as explained by Pope Francis himself: the Apostolic Exhortation, Evangelii Gaudium, that Francis considers something like his governing program. Evangelii gaudium is first of all the criterion through which Pope Francis chooses saints to be canonized. The formula the Pope has often used is that of the “equipollent canonization,” i.e., the proclamation of a saint whose veneration is widespread, without the need of a second miracle as required by the regular procedure. Pope Francis wanted to explain in person why he continues to make saints this way, probably aware that he had been much criticized for excessive use of the procedure. The Pope explained his ‘picks’ among new saints during his in-flight presser from Sri Lanka to the Philippines on January 15th. At the beginning of his remarks, he underscored that he had inherited from Benedict XVI the process of equipollent canonization (that of Angela of Foligno), and that he then chose other saints to canonize with the “simplified procedure” on the basis of the evangelizing criterion in Evangelii gaudium which calls for the Church to be in a state of permament mission. So in his view the saints he selects for this special procedure are noteworthy evangelizers who exemplify the central message of Evangelii gaudium. After Joseph Vaz, the most important missionary of Asia, who was canonized last week in the Philippines, the next candidate for equipollent canonization will be Junipero Serra when the Pope travels to the United States in September. The announcement of Junipero Serra’s forthcoming canonization was made by Pope Francis himself. This is the second revealing detail from this trip to Asia: with Francis no media plan or strategy is possible. The Pope does whatever he wants and whenever he wants. There is no way to prepare in advance. As Evangelii gaudium stresses, the Pope does not do what he does because “we’ve always done it this way,” but instead follows the advice he urged on all pastors in the Church to be “bold and creative in this task of rethinking the goals, structures, style and methods of evangelization in their respective communities.” So, under Pope Francis the notion of a papal trip or a papal decision prepared for in detail has given way. It is instead the era of the Pope as the only one in command, while others are engaged to interpreting his will. Although this state of affairs was probably unpredictable, Pope Francis’ attitude was already clearly set out in stories of his years in Argentina. Here, the third revealing detail from his latest trip comes out. In general, Pope Francis is unpredictable. But this unpredictability is tolerated by those who pushed for his election, while some among his supporters who may eventually succeed him as pope are increasingly seen enjoying the public spotlight. 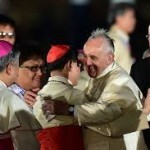 The focus of the papal trip to the Philippines concerned the poor, because – as Evangelii gaudium emphasizes – “there is an inseparable bond between our faith and the poor.” This focus on the poor has unbelievably strengthened the image of Cardinal Luis Antonio Tagle, the Archbishop of Manila, who has received ever more insistent media attention. Will he be one of the choices for pope in the ‘post-Francis’ era? Likewise, Cardinal Parolin needs to strengthen his hand in dealing with conflicts concerning the eventual competencies of the Secretariat for the Economy that is still without a governing statute, and he has to address Curia reform in order to keep it from touching the Secretariat of State that was initially supposed to be divided into a number of smaller entities. With his subtle but firm way of acting, Cardinal Parolin has gained stature. He is working in harmony with Cardinal Giuseppe Bertello, number one in the Vatican City State administration, and the two share a concept for the reform of the Vatican City State that makes it less a “State” and more a “service to the mission of the Church.” One of the next moves may be to issue a unified balance sheet for Vatican City State and the Holy See instead of two separate balance sheets. The contest over reforms is, however, still not over, and it will certainly not be completed before the end of 2015. Pope Francis – this is the fourth revealing detail from the Asian trip – does not seem too interested in the reforming process. He speaks about it, he takes part in meetings, but his priority is that the Church be in a state of permanent mission. “We need a missionary domain that brings salt and light to the world,” he writes in the Evangelii gaudium. And this is what you find in Pope Francis’ preaching, while Curia reform is not a hot topic even in his private discussions. Generally very attentive to what happens in the world, Pope Francis personally receives Vatican diplomats visiting Rome, while Benedict XVI chose to forgo most private meetings of this nature. Pope Francis wants to highlight the pastoral dimension of diplomatic work, and often speaks with Vatican diplomats about carrying forward their mission. Pope Benedict, on the other hand, made a different choice: he preferred dedicating time to long periods of face-to-face meetings with bishops during their ad limina visits. In this way Benedict applied the principle of communion. Pope Francis, on the other hand, seems to be one who gives instructions, more than one who exchanges opinions, a man alone at the helm who is fortunate enough to be in the right place at the right time. Pope Francis’ destiny – this is the fifth revealing detail of his recent trip – seems to be that of harvesting the fruits of his predecessors. On the flight back from the Philippines, he will fly over the air space of the People’s Republic of China, as he had done when he went to Korea. The first time he did this, it was considered exceptional. Now, this seems to be a more normal event, though it has its importance. Since he took over power, the Chinese president, Xi Jinping, has changed the pace of government. Xi Jinping knows the ‘machine’ of government, he has proven to be courageous and capable of big initiatives. The approach toward the Catholic Church – which came out in his response to Pope Francis’ congratulatory telegram at his election – is yet to be understood. But there is the possibility that an official Vatican diplomatic channel with China will soon be opened. This will probably not involve a nunciature, but a permanent chargé d’affaires that China may find acceptable. According to sources, talks have accelerated over the last two months. It would be the second diplomatic success of Pope Francis, after that of Cuba (which, however, came after a 50-year-long Church commitment to the island), and it would fit in with his ideal of a missionary Church. “All of us are asked to obey His call to go forth from our own comfort zone in order to reach all the ‘peripheries’ in need of the light of the Gospel,” Evangelii gaudium reads. This concern for the peripheries is the reason behind the rumor of papal trip to Erbil, Iraq: to meet Christian refugees. The upcoming encyclical on ecology – which the Pope made clear he will strive to complete in March – will certainly be filled with references to a missionary Church. Meanwhile it is also rumored that a first draft for the announcement of a Third Vatican Council is circulating, but no source has confirmed the report. However, other sources acknowledge the possibility of a papal document that would increase the limit of Cardinals voting in a conclave (i.e., Cardinals under the age of 80) from 120 to 140, thus increasing by 20 the limit that Paul VI established. But these rumors are out of synch with the interpretative key offered by Evangelii Gaudium, and fit more with the expecations on the papacy in general than with Pope Francis himself, because they involve a more long-term vision. True, for Pope Francis “time is greater than space,” but Evangelii gaudium also stresses that “realities are more important than ideas.” This is the reason Pope Francis in the end will adopt a more pragmatic approach toward curial reforms, while he seeks a prophetic approach in the missionary field. It is going to get much more worse. Afterall we catholics have already been warned in Matthew 24 and Revelation 13. We need to brace ourselves. Similar things were said about Paul VI before Humanae Vitae was issued. I defer judgment until after the Synod of the Family before declaring that Vatican II would be a disaster. Another revealing detail is the fact that the Pope chose to share the spotlight with Cd. Tagle but not with Cd. Ranjith. This shunning of anything remotely Traditional is also in Evagelii Gaudium and is a trademark of this pontificate. Is St Joseph Vaz more important than St Francis Xavier, or St Thomas the Apostle? I do admire Pope Francis’s focus on the poor during the visit to the Philippines and the refreshing spontanaiety of the Holy Father’s non-traditional approach to his mission in “bringing salt and light to the world”! The pope should exhort all Filipinos to be more honest. They might finally see the beginning of prosperity. The one good thing to come from Pope Francis is that he is waking people up more and more to the disaster of Vatican II and the reality of neo-modernism in the Church.